Candlestick charts have become the default for most active traders. Unlike line or bar charts, candlestick charts provide five data points (open, high, low, close and change) to help you instantly assess market sentiment. You can also look at combinations of candlesticks to determine changes in market sentiment that could lead to trading opportunities. All traders should have an in-depth understanding of these charts to maximize their odds of success. In this guide, you will learn how to read candlestick charts and truly understand what they mean and trade some of the most popular candlestick patterns. We will also show you real-life examples of candlestick patterns in action, as well as introduce the research and tools that expert traders use to find opportunities in across many markets. Candlestick charts have been around since at least the 18th century when Japanese businessman, Munehisa Homma, first documented the technique to track the price of rice contracts. While many traders were speculating on the price of rice, Munehisa considered market psychology when making trade decisions. His book, San-en Kinsen Hiroku, was the first to suggest that traders’ emotions influence prices. The technique was brought to the Western world by Steve Nison in his book, Japanese Candlestick Charting Techniques. The original Japanese names of candlestick patterns were largely retained when transferring this knowledge, although there are some rough translations that are commonly used to make the patterns more identifiable. For example, the doji pattern retains its Japanese name while abandoned baby is a rough translation. Since then, candlestick charts have surpassed line and bar charts as the most popular chart for securities analysis. Most charting applications default to candlestick charts and platforms like TrendSpider even include automated candlestick analysis. Candlestick charts get their name from their candle-like appearance. Each candlestick is composed of a real body, representing the difference between the open and close, and upper and lower shadows (or wicks), representing the difference between the high and low. The color of a candle depends on the close relative to the prior close, whereas the fill of a candle depends on the direction of the price during the period in isolation. Hollow candles occur when the price closed higher than it opened. Filled candles occur when the price closed lower than it opened. Green/White candles occur when the price closed higher than the prior close. Red/Black candles occur when the price closed lower than the prior close. Candlestick charts can be used alongside any other forms of technical analysis. For example, you can easily overlay indicators, apply moving averages or identifying chart patterns. The added benefit is that you can look for candlestick patterns at the same time, which can help you assess market sentiment, identify entry and exit points or confirm buy or sell signals generated using other forms of technical analysis. Candlestick patterns are simply a series of candlesticks that combine to provide an indication of market sentiment. For example, a candlestick that appears at a reaction high or low with short wicks and no real body is known as a doji and represents indecision in the market. 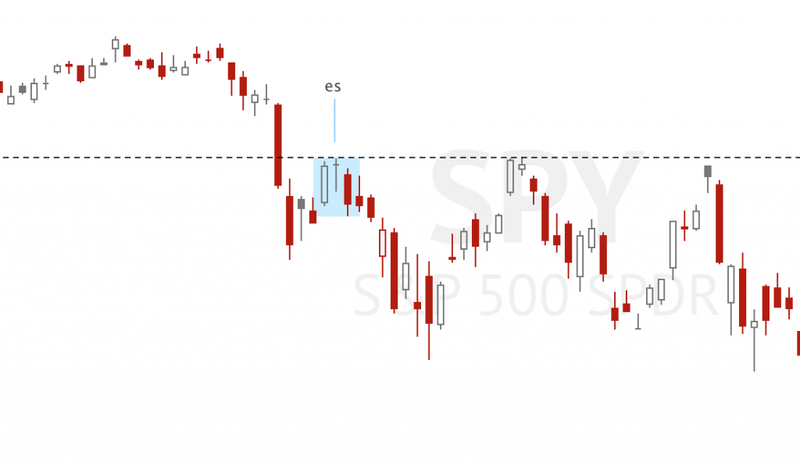 The rationale is that the lack of price movement and volatility during the session suggests that traders aren’t sure where the price is likely to head next. Candlestick patterns have several shared characteristics that are important to understand before diving into specifics. By understanding these characteristics, you can better interpret the patterns and see how they fit into the overall picture. The real body is an indication of how far the price moved between the open and close. Long real bodies indicate a strong move higher or lower and short real bodies indicate indecision or a tug-a-war between bulls and bears in the market. Candlesticks that don’t have any shadows are known as Marubozu Brothers and they’re the most reliable indicator of a strong trend since there’s very little indecision or uncertainty about the direction of the move. The shadow is an indicator of how volatile the price was throughout a session—even if the open and close were relatively close together. Traders often look at the real body’s position relative to the shadows to determine whether bulls or bears controlled the price. For example, a long upper shadow and a small lower shadow suggest that bulls initially controlled the price, but the bears took over by the end of the period—a potentially bearish signal. Candlestick patterns can be analyzed in isolation, but they’re most effective when you consider the wider context. For example, a doji pattern may suggest indecision during a given session, but if it occurs after a huge move higher, it’s likely that the indecision could lead to a reversal given the prior trend. Many candlestick patterns take into account prior trends—and the candlestick position within a given trend—to improve their predictive power. Candlestick charts and patterns serve many purposes, from instant insights into market sentiment to confirmation of chart patterns. Day traders may use candlestick patterns as independent trading signals or confirmations of a trend line breakout or breakdown, while swing or position traders may use them as confirmation or decision support. Either way, they are an incredibly powerful way to gauge market psychology. Candlestick patterns can help traders assess market sentiment at a given point in time. For example, you may be interested in trading a stock that suddenly gapped lower after a negative earnings surprise. The hourly candlestick chart may provide valuable insights into the market sentiment at a given point in time. For example, a spinning top suggests that there’s still indecision while a bullish engulfing suggests a near-term turnaround. Candlestick patterns can confirm a breakout or breakdown. For example, you may be watching an ascending triangle chart pattern and see a breakout happen. If the breakout candlestick was a doji on low volume, you might pass on the opportunity given the lack of a clear consensus. If the breakout candlestick was a Marabuzo Brothers candlestick with high volume, the breakout would be confirmed, and you might buy the stock. Candlestick patterns can be used to generate trading signals on their own. For example, you might determine that bullish engulfing that occur on high volume produce a favorable risk-to-reward ratio for a given stock. You might place trades following these occurrences without the use of any other technical indicators. These strategies are most commonly used by short-term day traders that enter and exit positions within seconds or minutes. There are hundreds of different candlestick patterns that can be helpful when assessing market sentiment or predicting future price movements. While candlestick patterns are no guarantee of future price movements, they can help tilt the odds in your favor when used in conjunction with other forms of technical analysis. Candlestick patterns may also work differently depending on the security or market that you’re analyzing. Doji patterns form when the open and close are nearly equal, creating a cross, inverted cross or plus sign, depending on the length of the upper and low shadows. Since there was little change between the open and close, the pattern indicates a tug-a-war between bulls and bears throughout the session, ending in indecision. 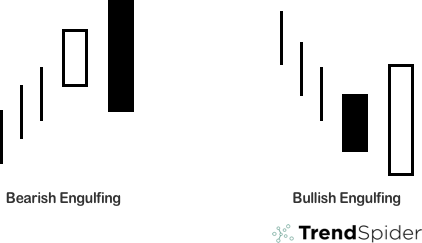 The bearish or bullish bias following the pattern is confirmed with the following candlestick or candlestick pattern. Long-Legged Doji: Long-legged doji have long upper and lower shadows that are equal in length, representing a high level of indecision in the market. Dragonfly Doji: Dragonfly doji have no upper shadow and a long lower shadow, suggesting that buyers regained control over the price after extreme selling pressure. Gravestone Doji: Gravestone doji have no lower shadow and a long upper shadow, suggesting that sellers regained control over the price after extreme buying pressure. In practice, doji patterns are most often used to predict an upcoming reversal of the prevailing trend. A dragonfly doji that appears after a significant downtrend suggests that there could be a reversal over the coming sessions. Conversely, a gravestone doji after a significant rally could mean that it’s time to take some profits off of the table. Long-legged doji could prompt you to wait on the sidelines until there’s more certainty in the market. Engulfing patterns are two-candle reversal patterns that occur at the end of a significant uptrend or downtrend. The first candlestick has a small real body and the second candlestick has a large real body that completely engulfs the prior day’s real body (but not necessarily the high and low shadows) in the opposite direction of the prevailing trend. Engulfing patterns are widely considered to be one of the more accurate candlestick patterns. Bullish Engulfing: Bullish engulfing patterns occur at the end of a downtrend where the first candlestick has a small bearish real body and the second candlestick has a long bullish real body that completely engulfs the prior candlestick. Bearish Engulfing: Bearish engulfing patterns occur at the end of an uptrend where the first candlestick has a small bullish real body and the second candlestick has a long bearish real body that completely engulfs the prior candlestick. In practice, bullish and bearish engulfing patterns are often used a confirmation of a breakout or breakdown identified with other forms of technical analysis and volume. Many traders look for bearish or bullish engulfing that are preceded by at least four candlesticks in the direction of the prior trend. For example, the best bullish engulfing patterns occur when there are four bearish candlesticks prior to the engulfing pattern. Hammer patterns occur when the price moves significantly higher or lower at open before falling or rallying during the session to close near its opening price. Unlike dragonfly and gravestone doji, the hammer patterns don’t require a close at the high—only near it. The lower shadow on a hammer or the upper shadow on an inverted hammer should be at least twice the size of the real body in order to for the pattern to be valid. Hammer: Hammers occur when the the price moves significantly lower at the open before rallying higher throughout the session to close near the open. While bears came into the session, the bulls absorbed the impact and the trend remained bullish. Inverted Hammer: Inverted hammers occur when the price moves significantly higher at the open before falling lower throughout the session to close near the open. Bulls may have briefly taken control over the price, but bears came back to ultimately control the session and kept prices lower. Hanging Man: The hanging man pattern occurs when the price moves significantly lower at the open before rallying higher throughout the session. Unlike the hammer, the hanging man closes the session slightly lower rather than slightly higher. Shooting Star: The shooting star pattern occurs when the price moves significantly higher at the open before falling lower throughout the session. Unlike the inverted hammer, the shooting star closes slightly lower rather than slightly higher. 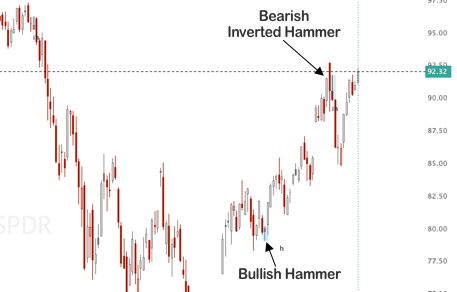 In practice, hammer patterns suggest that there could be a near-term reversal. Most traders that see a hammer emerge will add the security to a watchlist and wait for a confirmation to emerge before placing a directional trade. For example, you may notice an inverted hammer that occurs just above trend line support, suggesting a potential trend change, but you might wait for a breakdown on high volume in the subsequent candle before placing a trade. The evening star and abandoned baby are reversal patterns that occur when the market gaps higher or lower, but there’s not enough momentum to keep the strong move alive. These candlesticks do not appear as often as many other candlestick patterns, but they can be extremely reliable indicators of a price reversal, making them extremely important to understand when analyzing candlestick charts. Evening Star: Evening stars are bearish reversal patterns that consist of a tall bullish candlestick, a gap higher with a short candlestick and a gap lower with a tall bearish candlestick. The move suggests that buyers may have briefly sent prices higher, but there wasn’t enough buying pressure to maintain momentum, and bears took over. Abandoned Baby: Abandoned babies are bullish reversal patterns that consist of a tall bearish candlestick, a gap lower with a short candlestick and a gap higher with a tall bullish candlestick. The move suggests that bears may have briefly sent the price lower, but there wasn’t enough momentum, and the bulls ultimately took control. In practice, these candlestick patterns tend to be among the most accurate indicators of a reversal. Bulkowski’s Encyclopedia of Candlestick Charts found that both patterns had greater than 70 percent accuracy in predicting a reversal. The patterns work best when used in conjunction with other forms of technical analysis that can act as confirmation, such as volume and indicators like the RSI to show the strength of the move. Let’s take a look at a few examples of candlestick patterns in action to see how they can be used to make actionable trade decisions. The chart below shows a hammer and inverted hammer on the S&P Biotech SPDR (NYSE: XBI), where it could have been used to indicate the start of an uptrend. The inverted hammer may have been especially useful as a sell signal following a breakout from the upward price channel—an breakout that may have suggested the opposite. The price subsequently moved sharply lower to test trend line resistance before eventually rebounding higher. 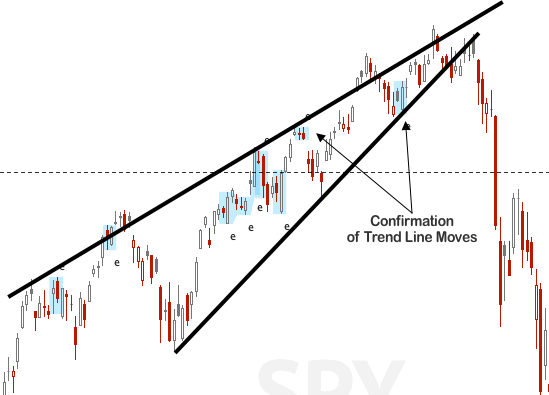 The chart below shows bullish and bearish engulfing patterns on the S&P 500 SPDR (NYSE: SPY), where they act as confirmation for trend line-based predictions. In the first instance, the price reaches trend line resistance and a bearish engulfing occurs, which supports a sell or short trade signal. In the second instance, the price reaches trend line support and a bullish engulfing occurs, which supports a buy trade signal. Different candlestick patterns may reach differently depending on the security and timeframe. In addition, some candlesticks may be too frequent to use as a dedicated trade signal (such as the engulfing patterns above), which makes them better-suited as a confirmation. It’s a good idea to experiment with different candlestick patterns on different charts to see what has worked in the past and apply those learnings toward the future. There are many different research tools and resources for traders using candlestick patterns. Thomas Bulkowski’s Encyclopedia of Candlestick Charts has become one of the most important resources for active traders using candlestick charts. By statistically analyzing the past performance of candlestick patterns, Bulkowski’s book rates the performance and frequency of each candlestick pattern. These insights can be useful for traders when developing trading systems or strategies based on candlestick patterns. In addition to Bulkowski’s book, there are many different online courses covering candlestick patterns, which show you how to identify and use them in action. Many of these courses provide a helpful introduction to candlestick patterns and show students real-life examples of how they can be helpful. There are also forums where students can ask teachers questions about certain patterns or how they can be applied in the market. 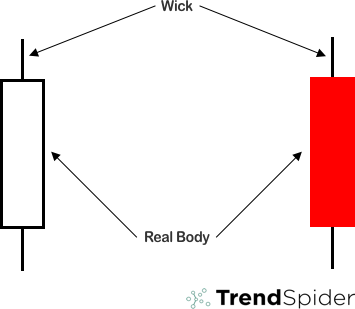 TrendSpider helps automate the analysis of candlestick patterns by identifying them on any chart with mathematical precision. After setting the candlestick patterns you’d like to find, the software automatically highlights them on the chart, so you can see how they performed for that specific security. You can also set up real-time alerts that fire off a SMS or e-mail when a candlestick pattern appears or when a series of conditions are met. In addition, TrendSpider offers free one-on-one training for anyone that signs up for a free trial. Expert traders will show you how to apply candlestick analysis in live, real-time market conditions rather than cherry-picked examples. Sign up today if you’re interested! Candlestick charts have become the de facto standard chart type for active traders. Depending on the situation, they can be helpful for reading market sentiment, providing confirmation for another technical signal, or for generating trading signals on their own. Most traders use candlestick patterns in conjunction with other forms of technical analysis to increase their odds of making successful trades. Sign up for a free TrendSpider trial and learn how you can automatically identify candlestick patterns and use them to tilt the odds in your favor.